University of Montana students presented their ideas to help the city reach its zero waste goal Wednesday night, with teams proposing a plastic bag tax, social marketing, and a zero waste certification for local businesses. The second annual QUEST Pitch Night brought city leaders and Davidson Honors College students together to collaborate on the city’s ambitious Zero by Fifty initiative, which was adopted in 2018 and aims to reduce Missoula’s waste by 90 percent by 2050. The teams pitched comprehensive recommendations they’ve honed throughout the 2018-19 academic year. Some ideas follow closely with the city’s adopted plan, addressing access, infrastructure, education and policy. Others viewed zero waste from a different perspective. “We know our Zero by Fifty goal is ambitious and complex, and it will take multiple solutions from many different angles,” Chase Jones, Missoula’s energy conservation coordinator, said in an interview. A panel of judges heard five teams pitch their ideas, including leaders from Home ReSource, UM Sustainability, the city of Missoula and Missoula Compost Collection. The winning team will have the opportunity to intern with Jones and the city’s Energy and Climate Action Office. Team members will then work on implementing their idea or working on other goals for the initiative. 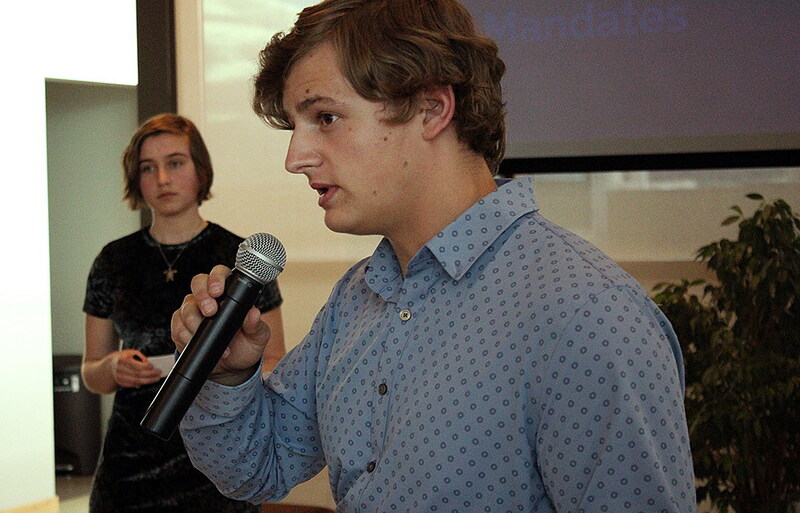 Many of the presentations gave consideration to the city’s budget, which would fund the students’ ideas. Mayor John Engen said that thinking about zero waste from a practical standpoint is essential, as is further collaboration with UM. Teams proposed implementing a plastic bag tax, a pay-as-you-throw policy, creating a pledge program, and finding ways to repurpose food waste. Montanans send 2.5 times more waste to the landfill than the national average, per person. One group explained that social marketing is more effective than enforcing policy changes, while another illustrated that zero waste business certifications have been successful elsewhere. Boulder County, Colorado, implemented a certification program and gained over $2 million in savings on utility bills and 4,430 cars worth of greenhouse gas emissions savings. Keeping Missoula’s high quality of life through collaborations was a oft-mentioned goal of the students. “It’s rooted in all of those values that make up Missoula and are sort of the DNA of Missoula, as well as rooted in our commitment to addressing climate change,” Jones said. The QUEST Pitch Night’s first student presentations in 2018 focused on housing, with two students interning with the Office of Housing and Community Development. Those students focused on how accessory dwelling units can be a viable way for Missoula to create housing without taking up valuable land. The winners of Wednesday night’s event will be announced later in the week. “We have great resources with the city, we have great resources with the University of Montana and we need to continue to celebrate those and create more links and work together more often,” Engen said.